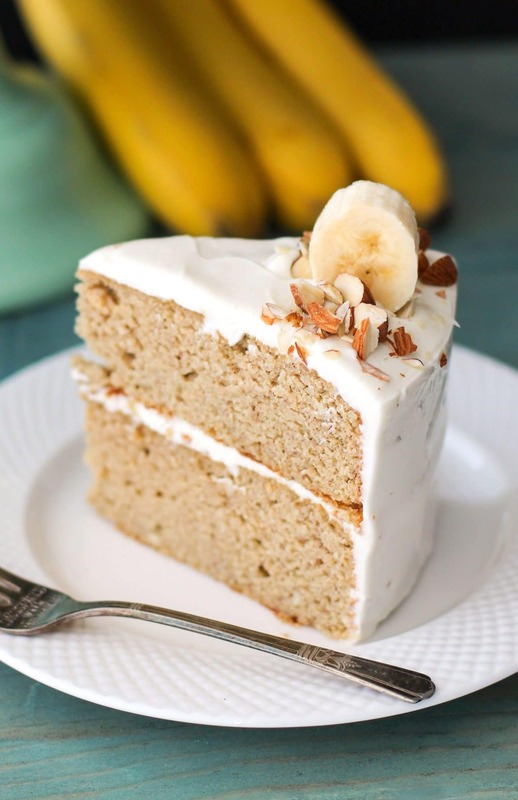 This Healthy Banana Cake with Cream Cheese Frosting is so sweet, moist, fluffy and delicious, it’s like Banana Bread in cake form, made secretly refined sugar free, high protein, high fiber, and gluten free too! Now, I should probably explain #1. As a kid, I was obsessed with basically everything that was terrible for me (aka storebought chocolates and candies of all kinds). I would get these Cadbury Mini Eggs in the Costco-sized bags and go through about 1 bag per week. I’m talking the 36oz bag people. So anyways. Moving onto #2. The Easter Sunday service from 2007. Back in 2007, I still lived in Connecticut and my family and I attended a service that was held at the beach. Back then, it used to get crazy cold from October all the way up to April. And March 2007 was furrreeeeeezing. A few steps out of the car and my face was already frozen and felt like it was about to fall off my face. We had arrived early and I decided to volunteer and help serve the attendees hot chocolate. Not because I was such a good kid and wanted to help out (hehehe), but because the volunteers got to stay slightly sheltered by the weather near the cabana, all alongside a big thermos tub thing full of delicious, sugary hot cocoa. HOW COULD I SAY NO TO SUCH AN OPPORTUNITY. Anyways, this Easter? 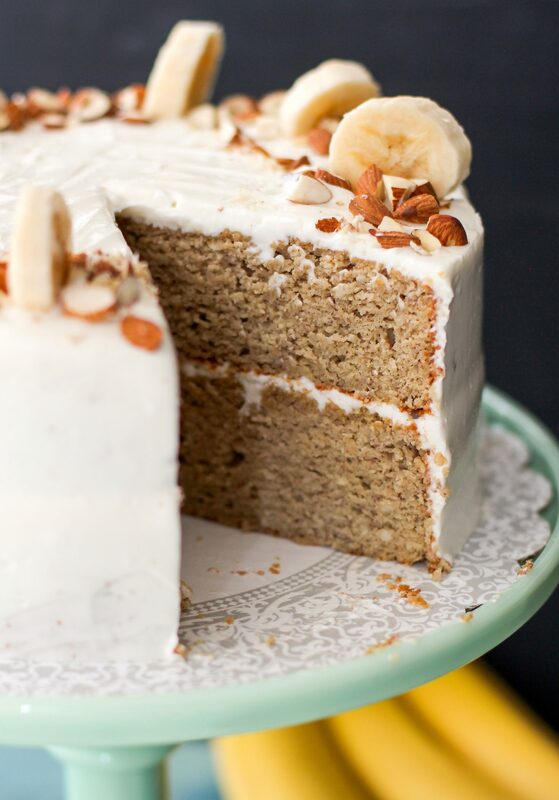 I’ll be indulging in something much tastier, much more satisfying, and secretly, oh so secretly, much healthier: this Healthy Banana Cake with Cream Cheese Frosting. Join me, will ya? I solemnly swear that I am up to no good… just eatin’ frosting straight up. Hehehe. 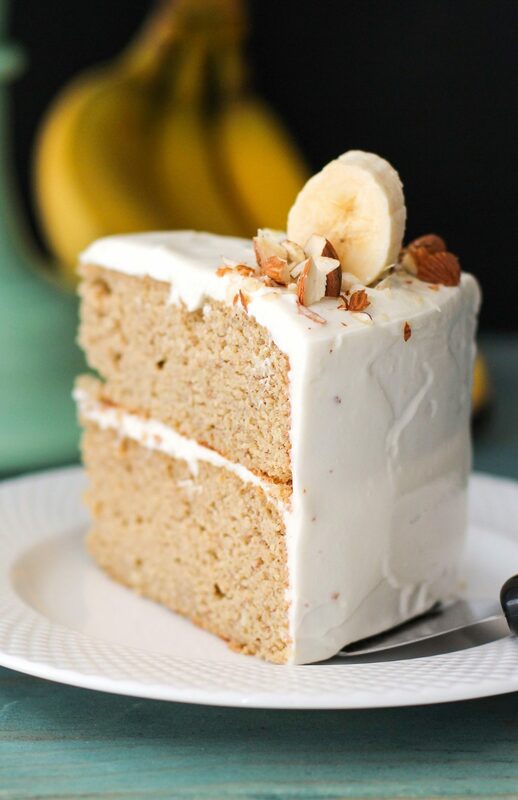 With each bite of this cake, with each banana bread-like bite, you’ll be instantly addicted. You’ll need another bite. But don’t you worry now. This cake is good for ya. It doesn’t taste like it, but it is. 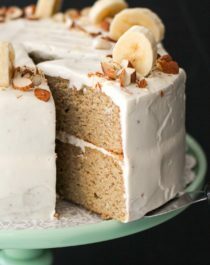 This Healthy Banana Cake with Cream Cheese Frosting is so sweet, moist, fluffy and delicious, it's like Banana Bread in cake form, made secretly refined sugar free, high protein, high fiber, and gluten free too! In a medium-sized bowl, whisk together the coconut flour, erythritol, almond meal, baking powder, cinnamon, baking soda and salt. In an electric stand mixer bowl fitted with a whisk attachment, add the mashed bananas, yogurt, almond milk, eggs, egg whites, vanilla extract, stevia extract and butter flavor. Mix on low speed until completely even. Turn off the mixer and dump in the dry ingredients. Mix on medium speed, then high speed, until the ingredients are fully incorporated. Pour the batter into the prepared cake pans. Tap the pans on the counter a few times to level out the batter. Bake for 55 minutes, or until the surface springs back when tapped. Let cool completely in the pan. 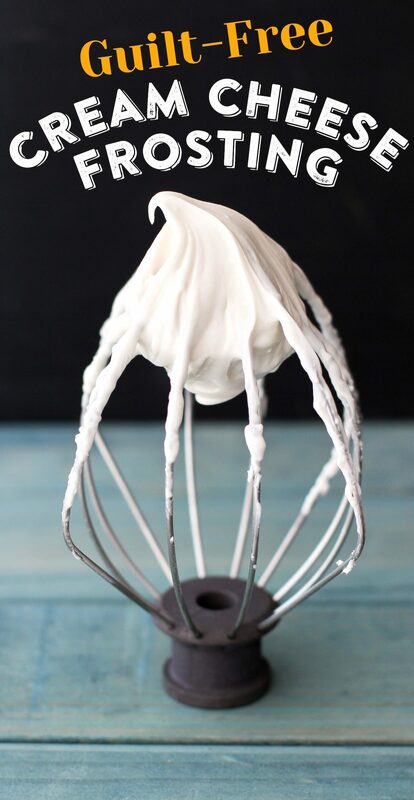 In an electric stand mixer bowl fitted with a whisk attachment, add all of the ingredients and mix on high speed. Scrape down the sides of the bowl and mix until completely smooth. Frost the cake, then refrigerate for 1 hour to firm up. Slice and serve! Yes people. 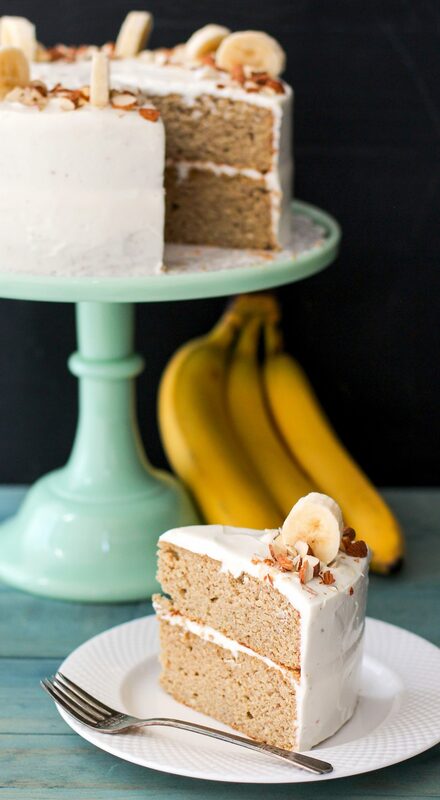 A large slice of sweet and delicious Banana Cake with a rich and luxurious Cream Cheese Frosting has only 310 calories. Plus, 11g of filling fiber and a whopping 18g of protein. BOOM. Much better than the alternative, which has 560 calories, 94g carbohydrates, and 68g sugar. That’s more than ⅓ cup sugar in one slice. Yeah, I’ll GLADLY skip all that unhealthy nonsense and instead, eat a slice (or two) of my healthified cake. Always listen to your conscience people. This stuff is just good for the soul. In total (for bananas + yogurt, there is 547 grams) – do you think I could just use 547 grams yogurt instead of bananas + yogurt? Thanks, love! Oh no! A banana allergy! This cake recipe was adapted from my Low-Carb Vanilla Cake recipe, which uses applesauce and yogurt instead of banana and yogurt. However, the measurements are a little different… banana doesn’t sub applesauce at a 1:1 ratio. I don’t think yogurt will work very well in place of all of that banana. The cake might turn out too dense or moist. Sorry Sophie! Thanks for replying in any case 🙂 You’re awesome! I will try the other cake perhaps…!!!!! 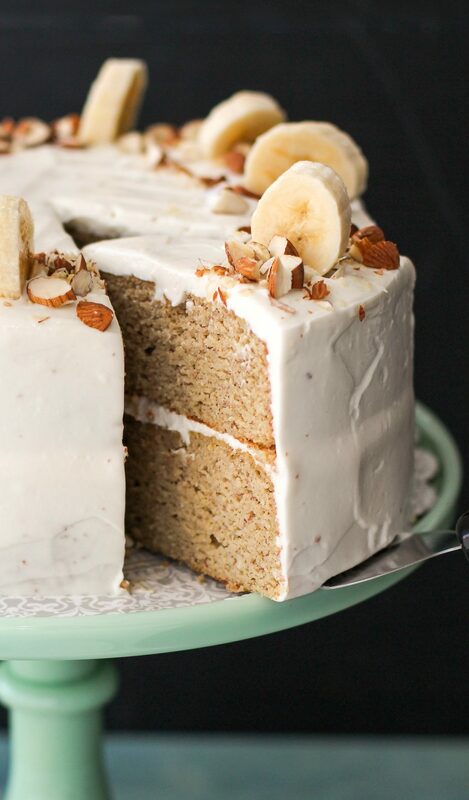 This cake reminds me of one of my favorite pies…banana cream! It’s like banana cream pie in cake form. So yum! And I feel ya on that story. Just recently I went to a wedding of a coworker of mine in January. In Texas (but it was still pretty cold here in early January!) and she had her ceremony outside after the sun was already down. Everyone there was shivering!! So. Damn. Cold. I’m ready for Spring. An Easter mass on the beach? What Im so jealous, but only if it was nice out lol! But this cake is everything I need right now! Its like a dressed up version of banana bread with frosting! YUM! Can I make this cake and NOT SHARE IT with anyone?! This looks SO good! This looks delicious! Only query is it seems like there’s a lot of coconut flour – did you mix up the quantities for the almond and coconut flour by any chance? Can’t wait to get baking! This recipe uses both coconut flour and almond meal for flavor and texture. Almond meal can’t replace any of the coconut flour, and vice versa. Hope you like the recipe Rosie! This does look really good… but it does have a lot of eggs! Is it possible to replace some or all of the whole eggs with flax or chai or something else? Awwww thank you so much Sara! Made this today and it turned out great! I was really impressed with the moist texture and great flavor. It really is like banana bread cake. I replaced the egg whites with meringue powder prepared according to directions because I didn’t have that many eggs. I also used grass-fed butter in the frosting in place of Greek yogurt, and I added a little heavy cream to lighten the texture. Delish! Can you freeze any leftover for later? Hi! I want to make this for my son’s birthday but with some adjustments. Is it possible to use less bananas? What can I use in place of bananas if i wanted to use one or two instead of three? This recipe needs the bananas for sweetness, moisture, and fluffiness. If your son doesn’t like bananas, this recipe probably isn’t for him. Pingback: SECRET Ingredient Green Velvet Cake! Like Red Velvet Cake, but green!